There’s, ahem, a lot to get worked up about these days. But, when we’re all stressed out and freaking out, we simply cannot go out and do the things we need to do in this world. Without taking care of ourselves, we can’t be of service to others — our families, our friends, our communities. So, with that in mind, we share with you this special guest post from Healthline and Athleta that’s based on this Yoga for Calm article. Take five minutes and run through these centering poses today. Your body and mind will thank you. When you’re stressed, your body goes into its primal fight-or-flight response. As a result, if you’re constantly experiencing chronic stress, you may end up with reduced immunity, heart disease, anxiety and depression. To combat these health issues and reduce chronic stress, a practice like yoga helps to ground you in the present so you can better process your thoughts, feelings and emotions. It’s important to note that not all stress is bad. The human body’s perfect balance of stress is known as eustress. Eustress can motivate you to focus in the short-term. Think of it like that extra push of motivation you get before a looming deadline. Chronic stress, in contrast, will consume your day, making it difficult to complete simple tasks and activities. If you want to find calm in your day and learn to destress, try these yoga poses to ground yourself and become more present. Child’s pose is excellent for calming your body. Start on all fours with your legs and knees hip distance apart. To open and lightly stretch your hips while you’re in this position, move your knees towards the edges of your mat. Next, sit back onto your heels, rest your forehead on the mat, and place your arms and hands forward along the mat or on either side of your body. Rest in this pose for 5 to 10 breaths. Constructive rest is a gentle pose that will help you feel supported and grounded. To get started, lay on your back with your feet on the ground hip-width apart. Once you’re settled, move your feet wider towards the outside of your mat and allow your knees to gently fall towards each other. Next, inhale and open your arms to a t-shape on the floor. As you exhale, wrap your arms around your chest with the right arm on top. Stay in this position for 10 breaths before switching to have your left arm on top. This simple cross-legged position will help you feel grounded. Sit on your mat with your legs crossed. If you have low hip mobility you can sit on a folded blanket or cushion. As you sit, your shin bones should cross in the center of your body while your knees are directly in line with your ankles. Keep your feet flexed to protect your knees. Next, place one hand on your lower body and your other hand on your heart. Follow this with 10 deep, full breaths to fill the areas of your body where your hands are resting. Pigeon pose stretches the hip flexors. This is excellent for calming yourself and destressing, as we hold a lot of tension in our hip flexors. To practice this pose, start on your hands and knees then bring your right knee up behind your right hand. Let your knee gently fall towards the outside of your mat, keep your calf parallel to the top of your mat and keep your toes flexed. This will help you to stretch your hip flexors while protecting your knee. If you’re feeling extra flexible, walk your hands forward and rest your forehead on your mat in front of your right leg. Hold this pose for three minutes before switching to your left leg. Prone savasana will help you feel relaxed and supported. Start by laying on your stomach with your arms by your sides. Your legs can rest comfortably along your mat. To rest your head, you can turn your head to one side and switch halfway, bend your arms to form a pillow or fold a towel and place it under your head. Next, let your body relax into the ground beneath you. Breathe slowly and stay in this pose for 5 to 10 minutes. Gently come out of this pose by slowly moving to a table top position and resting back into child’s pose. Practicing yoga to calm yourself and be grounded in the present moment is an excellent way to destress. 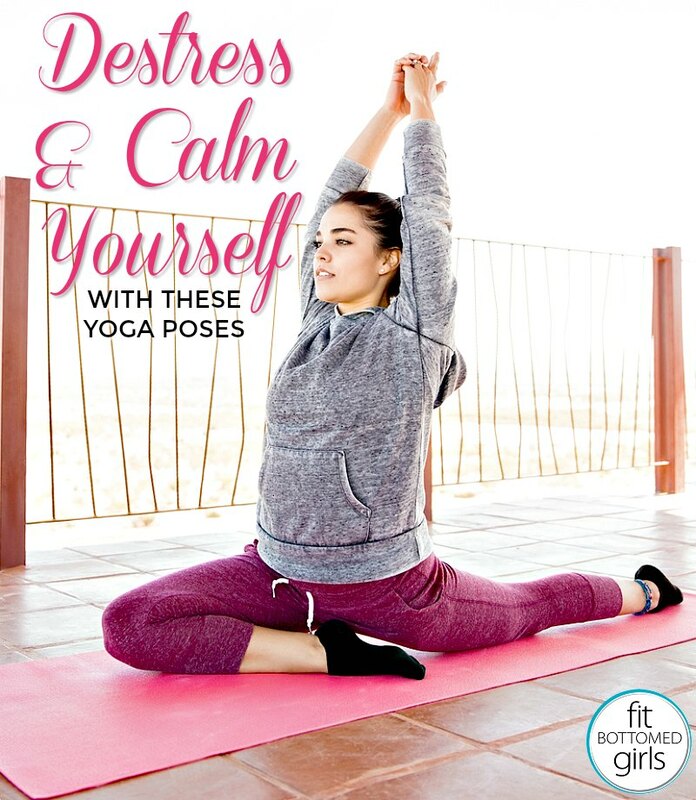 Next time you’re feeling stressed, try practicing some of the poses above. If you want to start your day with a calm and grounded approach that will last, practice a few of these poses each morning. There’s no particular order you need to practice these poses in as yoga is all about listening to your body. When you can learn to listen to your body and thoughtfully respond to how it’s feeling, that’s when you’ve truly begun to master the mind, body connection. Resting with relaxing practices like yoga is key on my fitness journey!